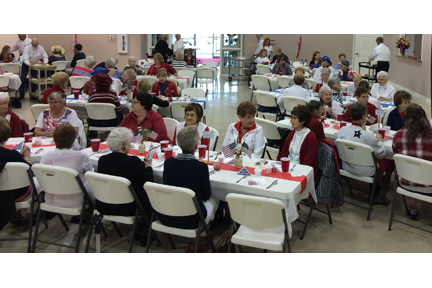 The “Celebrating America” Ladies Luncheon at St. John’s UCC-Cappeln on April 21st was truly a red, white and blue event. The entry way to The Family Life Center was decked out with very cute, large “firecrackers”. Patriotic kites adorned the walls and stage, and the tables were beautifully set in either red and white, or blue and white, with silver stars sprinkled about. Each table centerpiece contained three small American flags in a patriotically painted jar. 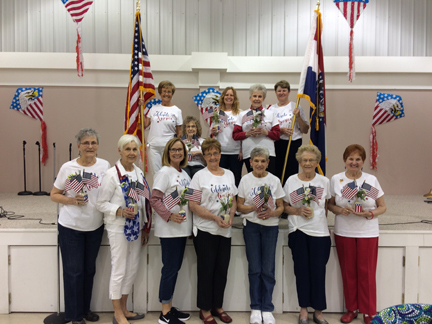 The luncheon was hosted by the Mary and Martha Circle, whose members were dressed in matching “Celebrate America” T-shirts. Approximately 100 guests attended, and most of them were also attired in their best patriotic colors. In honor of the theme, an American flag and a Missouri flag were purchased by the Mary and Martha Circle with help from the St. John’s congregation. 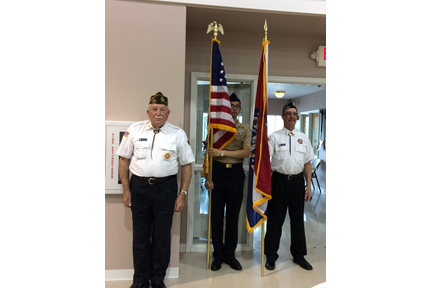 The flags were officially presented and posted before the luncheon by veterans Ray Welge and Dennis Brown, and Boy Scout Max Welge, and will remain permanently displayed in the Family Life Center. Following the flag presentation, the Pledge of Allegiance was recited. A delicious lunch followed, featuring a slice of ribbon sandwich, slaw with apples and craisins, jello in red, white and blue layers, and a cream cheese-filled chocolate cupcake. In keeping with the tradition of this annual event, the lunch was served by a group of now very experienced gentlemen servers from the congregation. After lunch, 18 door prizes were awarded, including four 3’x5’ American Flags. Next, entertainment was provided by four young girls who are part of the Patt Holt “Just Kids” singing group. The performance featured a selection of show tunes, classic favorites, and patriotic songs including a medley of theme songs honoring all branches of the U.S. Military. Carole Lattimore served as the overall Chairman of the event and the Committee chairs were: Decorations and Door Prizes — Sharon Jackman, Loretta Micke, Donna Brakensiek and Glenda Blake; Menu — Marilyn Jones; Advertising and Ticket Sales — Hazel Roever and Bonnie Hicks. All members helped decorate and prepare for the luncheon. The Mary and Martha Circle is a ladies group from St. John’s UCC which meets monthly on the third Thursday at 1:30 p.m. in the Family Life Center, 60 St. Johannes Lane, Cappeln, MO. Activities and projects of this group are all benevolent in nature and have helped many, many causes. Members of the group are also big supporters of the New Melle Food Pantry and the Troops Mission of St. John’s that has been ongoing for 11 years. A huge thank you is extended to all who attended and supported this event. Approximately 100 guests attended this year's luncheon. 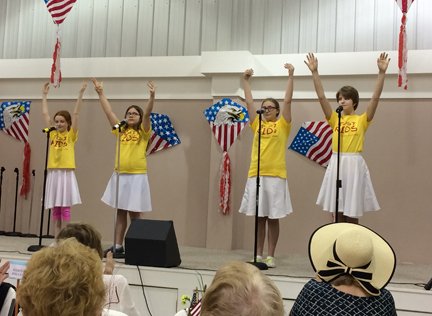 Members of the Patt Holt “Just Kids” group performed. Mary and Martha Circle members (L-R) front: Betty Hendrich, Opal Holcomb, Catie Schmidt, Loretta Micke, Carole Lattimore, Doris Wildschuetz, Kitty Monigold. Back: Sharon Jackman, Donna Brakensiek, Glenda Blake, Hazel Roever, Marilyn Jones. 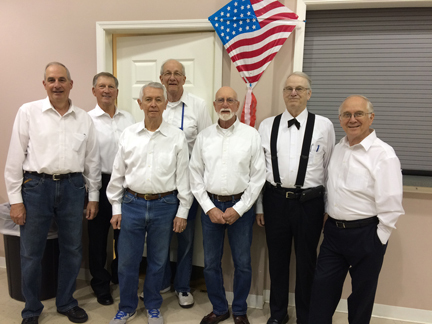 (L-R) Gentlemen servers: Clark Allers, Jim Jackman, Jim Lattimore, Don Hendrich, Burce Kisslinger, Glen Davis, Devin Jones. Ray Welge, Max Welge, Dennis Brown.